When the afternoon drags on, the little nagging voice or rumble in the stomach can take over. When the empty feeling hits the stomach, snacking isn’t an option, it is a requirement. Even though a snack is a good idea, the right type of snack is imperative. No one wants to throw away the morning working or the healthy choices to curb that afternoon hunger. Atkins HarvestTrail Bars are the new snacking solution. One of the keys to a satisfying snack is the combination of protein and carbs. The carbs offer the instant gratification to the imminent hunger. The protein maintains satisfaction for a prolonged time. But not all snacks or snack bars are created alike. The important components are the amounts of sugars, carbs and overall calories in the snack itself. The Atkins Harvest Trail bars offer a balance of protein and fiber while keeping net carbs and sugars in moderation. The result is a bar that satisfies yet doesn’t overindulge. Each snack bar contains less than seven grams of net carbs, less than four grams of sugar, and no artificial colors, flavors, preservatives, or sugar alcohols. 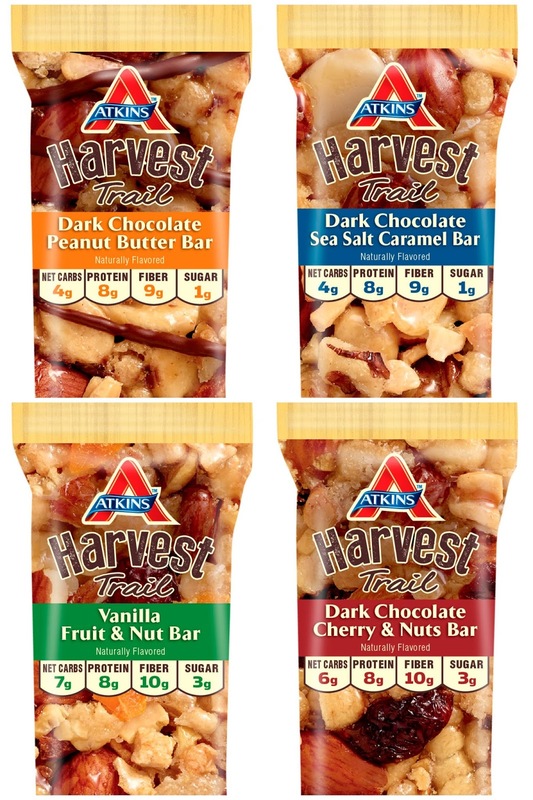 The Atkins Harvest Trail Bars are available in four flavor options. These flavor combinations balance fruits and nuts with a sweet twist. Whether your flavor preferences lean toward less sweet dark chocolate or sweeter vanilla, one bar will be a perfect fit. Dark Chocolate Sea Salt Caramel Bar: With just four grams of net carbs, this dark chocolate and caramel bar is mixed with nuts and salt. For the sweet and salty palate, this bar will be a hands down favorite. Vanilla Fruit and Nut Bar: For a lighter option, this bar features sweet vanilla yogurt sprinkled with fruit and nuts. Your favorite yogurt cup is transformed into a portable version with just seven grams of net carbs. Dark Chocolate Peanut Butter Bar: The combination of chocolate and peanut butter is a perennial favorite. This bar is the guilt-free version of the favorite creamy peanut butter and chocolate combination. Dark Chocolate Cherry and Nuts Bar: The decadent combination of chocolate and cherries doesn’t have to lead to calorie overload. This sweet and tart bar has only six grams of net carbs for a perfect way to curb that sweet tooth. As a busy mom, I rarely get the “true” opportunity to enjoy a daytime meal. From carpool to meetings to life, there isn’t down time. My biggest problem is that I enjoy good food. There is nothing better for me to linger over an luxurious meal. Flavor is king in my world. So those boring snack cakes or bags of goodies just won’t cut it. I like the Atkins Harvest Trail Bars because the flavor combinations have depth. There are layers of flavor that unveil with each bite. From sweet to salty to subtly fruit, these snack bars curb my cravings. Plus, I can throw a couple in my purse for those moments when my stomach is rumbling beyond control. An additionally plus is that my kids enjoy them as well. I am on a mission to develop my kids palates. Kids can enjoy all types of food, cuisines and flavors. Nothing needs to be dumbed down for kids. As important, kids need good nutritionally choices. Pumping them full of sugar isn’t beneficial. The Atkins Harvest Bars are enjoyed by everyone (especially after those long swim practices). Atkins Harvest Bars fit within the Aktins plans, which focus on a person’s carb totals. Whether your goal is to lose weight or to live a balanced lifestyle, Atkins’ products can help support your needs. The new Harvest Trail Bars are available now and retail for approximately $6.48 a box. Are you ready for better snacking options? 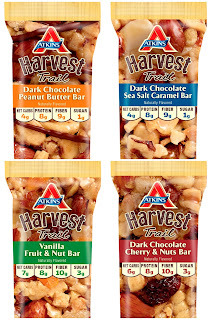 Check out Atkins Harvest Trail Bars and keep hunger at bay. Disclosure: This post was sponsored by the Role Mommy Writer's Network.